Discussion in 'Gambling News' started by Kotsy, Oct 22, 2013. NetEnt online video slots keeps growing and growing. Watch for the newest release at Vera&John Casino!! Secret of the Stones™ will become available for real play at Vera&John Casino on October 24th. Walk through the mist of this inspired Celtic themed video slot. 25 paylines with free spins and an incredible bonus round choice. Players will be transported to a lush green garden. Choose from 20 Celtic carved stones. You have the chance to pick your added bonus feature from additional free spins, wilds and more. 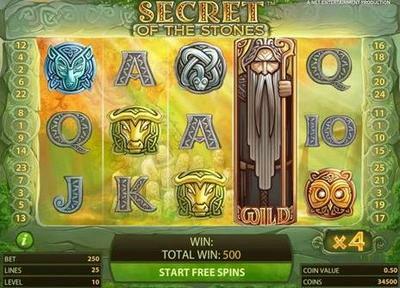 Look forward to playing Secret of the Stones™ at Vera&John Casino.